Deportation has become a billion-dollar industry. Between the second quarter of 2014 and 2015, Corrections Corporations of America’s (CCA) earnings leaped by $49 million. A single CCA facility in Dilley, Texas generated $100 million in the first half of 2015 alone. CCA can thank desperate asylum seekers from Central America for their success; the border surge motivated the Obama administration to award it a billion-dollar deal to build a family detention center for women and infants. This is all made possible because Congress mandates that immigration enforcement fill a daily quota of beds. CCA and the GEO Group have become the two largest private contractors. The profit motive directly compromises the judicial system, as these companies are incentivized to detain as many people for as long as possible. 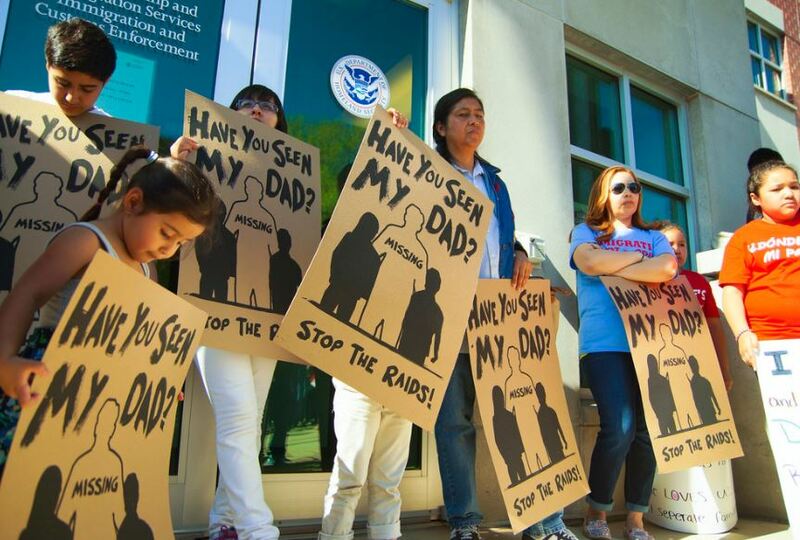 As a result, the private deportation machine gets rich from impoverished immigrants by violating their basic rights. In August, the Department of Justice (DOJ) released a memo calling for an end to government use of private prisons. It said what public advocates and researchers have been saying for decades: that private prisons do not produce better outcomes than publicly operated ones. Many see this memo as a win, and it certainly is: everything we do to remove capitalist logic from our criminal justice system will improve it. The memo illustrates how the carceral marketplace has shifted from the “war on drugs” to the “war on terror,” but it doesn’t go far enough. It does not cover the Department of Homeland Security (DHS), which has authority over immigrant detention centers. 62 percent of detained migrants are in privately run facilities. Nor does it cover state and local prisons. In the United States, 2.3 million are incarcerated. The DOJ memo moves 22,000 — just 1 percent — from private to public prisons. It will surprise no one to read that the immigration sector has become increasingly securitized post-9/11. Chebel d’Appollonia defines this as “the process through which Western political elites — governments, leading political parties, and associated policy networks — rhetorically frame immigration as a security threat.” Behind the cover of national security, governments have incredibly ample discretion, resulting in a compromised form of democracy in which transparency, accountability, and civil liberties are readily violated. The Urban Institute’s Justice Policy Center found that the number of immigration offenders in federal prisons tripled between 1998 and 2010, representing 12 percent of the total prison population at the end of the study. Federal prisoners increased by 77 percent in the same period; 2010 marked an all-time high. Immigration offenses accounted for 56 percent of this increase, followed by drug and weapon offenses. Moreover, the number of immigrants detained each year has almost doubled, rising from 204,459 in 2001 to 429,247 in 2011 according to the National Immigration Forum. Costs have also skyrocketed. The watchdog organization Detention Watch Network (DWN) reports that ICE held approximately 392,000 immigrants in 2010. At the average cost of $122 per day, this cost taxpayers about $1.77 billion. Corporations have rapidly adjusted to these market forces in the aftermath of 9/11. Private contractors now provide about half of the beds in detention facilities. CCA was nearing bankruptcy before 9/11; its revenues have more than doubled since then as it won more and more federal contracts. According to the DWN, CCA operates a total of fourteen ICE-contracted facilities with a total of 14,556 beds. In 2009, CCA averaged about 6,199 detained immigrants per day. The GEO Group has seven facilities with 7,183 beds. In 2009, it managed an average daily population of 4,948. Their lobbying has been effective. In 2014, Congress passed an appropriation bill that devotes $1.84 billion to DHS detention facilities and requires DHS to “maintain a level of no less than 34,000 beds.” In the past three years, DHS has increased its total budget 22 percent, now devoting $2.2 billion to continue funding detention beds. CCA, the GEO Group, and similar companies also work at the state level. In late 2010, it was reported that the private prison industry not only sponsored, but also drafted the infamous Arizona immigration law, SB 1070. Following this revelation, Byron Price, author of Merchandizing Prisoners, and I began to investigate these companies’ lobbying practices. It begins with an American Legislative Executive Council (ALEC) task force that sponsors and drafts harsh legislation and spends lobbying dollars to plant it state legislatures nationwide. Once these laws pass and the number of incarcerated individuals rises, the corporate originators of the laws rake in huge profits. State legislatures passed a record number of immigration bills in 2011. More than six hundred new bills were filed in January alone; most aimed to limit immigrants’ rights. This is no partisan effort: both Republicans and Democrats received funds from CCA and the GEO Group. As the data above shows, the detention industry flourished under both the Bush and Obama administrations. In fact, Obama grew it by about 3,600 percent. We can only expect that President-elect Trump, who loves private enterprise almost as much as he dislikes immigrants, will grow it even more. Surely, the DOJ severing ties with private prisons represents a step in the right direction. But it is only one piece of a much larger fight. The memo took scholars’ and activists’ claims about the faults of private incarceration seriously. But it left a lot out, too. The memo doesn’t mention that immigration enforcement has created an entire industry dependent on expanding securitization, which not only includes contracts with private industries for detention beds, but also includes for technology, equipment, and transportation. A number of economies are being built that fiercely rely on disenfranchising immigrants and asylum seekers. The memo doesn’t mention that the DOJ’s decision will simply deflect responsibility onto other governmental units at lower levels, handing autonomy over to state, county, and local government units. This provides plenty of opportunities for governments to privatize services in their “pursuit of fiscal efficiency.” Whether the federal government wishes to lead states and local governments to reduce the role of private prisons remains unclear. The memo simply doesn’t say. The memo also fails to mention that requiring transparency from private institutions and holding them accountable is nearly impossible. The increase in immigration-related detention has become an economic opportunity, a source for local revenue and recession-proof jobs. A tough stance on immigration is overwhelmingly politically expedient, as the presidential election demonstrates. Combined, we have a global political-economic landscape that enacts harsher detention policies because they are profitable. Private prisons harm incarcerated individuals and workers. The market introduces a number of dysfunctional behaviors designed to cut budgets and increase revenues. This includes providing substandard food, restricting access to supplies for detainees, cutting health-care costs by altering dosages, and ignoring medical standards. Workers can expect longer shifts for less pay and increasing automation. And these companies are motivated to maintain secrecy to keep the public’s adverse reactions from interfering with their profit margins. The ultimate win wouldn’t just end the use of private prisons. It would reform sentencing laws, reduce mass incarceration, reestablish humane conditions and due process, and implement immigration and security policies not contingent on citizenship status, but afforded for all. The DOJ memo is a small step in the right direction, but we have a lot further to go.